with positions (not playing triple ball) and they were all super excited! therefore losing the set 25-11.
any good hits, therefore losing the set 25-12 and losing the following set the same way with 25-11. Attack Venom had a huge lead of 15-7. Venom was unable to keep the lead and finally lost 25-23.
were flying all over the court but unfortunately they lost the set 27-25.
get better. But next time Venom plays U15 Attack Red, the game will be much closer. be ready for February 16th, the 14U boys McGregor Cup. the boys on a fantastic first 15U tournament!! After a successful finish at the Provincial Cup, the 14U boys Black Venom go into the Challenge Cup as a confident team. Their first game was against Storm Cyclones. In the first set, The Black Venom charged forward with great defense and smart attacks winning the set 25-19. In the second set, the boys fought hard and went for every ball but just came short and lost 20-25. In the last set, the boys lost 12-15. In the next game, the boys played the Waterloo Predators. In the start of the match, the boys went down losing 5-1, later they fought back, making it 10-10. The rest of the game just fluctuated, but near the end the Preds took over and won 21-25. In the next set the Predators dominated the game and won16-25. After a very short lunch break, the team was ready to play again. They faced the London Fire. In the first set, the Fire was up 11-2, but Black Venom quickly caught up winning 25-21. In the next set, both teams were at head to head switching points but the Fire took off and the Venom couldn’t catch up, therefore they lost that set 17-25. In the third set, the boys started out rough lagging 8-2. Even though Venom eventually caught up, they still lost 10-15. The next game was against the Markham Stingers and if you’ve read the other articles you can tell there’s a bit of tension between our two teams. The first set started out with Black Venom playing strong game, eventually leading 10-3. But after a time out on the other side, the Stingers quickly caught up to make it a close game. The Venom held out and still pulled out a win 25-22. In the next set, the Venom had great attacks and a lot of blocking. The score turned out to be 25-18 in Attack Venom’s favour. Since the Venom couldn’t compete for the semi-finals, they were competing for 5th which would keep them in the top division. Their last game was against Georgetown Impact to see who would stay in the Premiere division. The first game went well as Black Venom was holding up pretty well. But once Georgetown’s big kid came up to the front row, Attack Venom couldn’t seem to keep up with his big hits and Venom lost 21-25. In the second set, the Durham Attack Venom pulled it together winning 25-18. In the final set, the Venom dominated the Impact winning 15-5. Overall Black Venom placed 5th and will continue to compete in the Premiere division. Congratulations boys and parents. Our first OVA road trip was very successful because it was a complete team effort! Since the last tournament, DA Black Venom has been training hard to be ready for their next tournament. They have been practicing triple ball format because that is what they will be playing for their next tournament, the Challenge cup. There next tournament is at FE Madill High School, in Wingham, 3 hours away from Durham. The boys are excited and can’t wait to crush the teams they will face. The boys have also grown more confident, as they should, because they came second at their last tournament. During practices, Mike always says, “Everyone is a setter’’. With coach Mike’s inspiring words and the teams’ determination, The DA Black Venom go in to the challenge cup ready to play. Over the winter break, there wasn’t much volleyball, but there was lots of fun. After a silver medal win at the Provincial cup, the boys were happy and proud. Some of the activities the boys did over the winter break were playing the parents, a little indoor beach fun and tons of individual activities with each other. The play the parent’s night was at one of their practices, the parents and siblings of the boys formed two teams, and the DA BLACK VENOM had a mini tournament. The beach playing was designed by Ray Lee. The indoor beach was at North Beach in Toronto. For many of the boys, it was different to play beach instead of indoor because it was so much harder to hit. Even though it was a struggle, the boys bonded together, as a great team should. All of these activities helped to bond the team so that they can be ready for the Challenge cup. DA Boys 14U Black Venom Wins Silver! December 8th, 2012. DA Boys 14U Black Venom win SILVER! 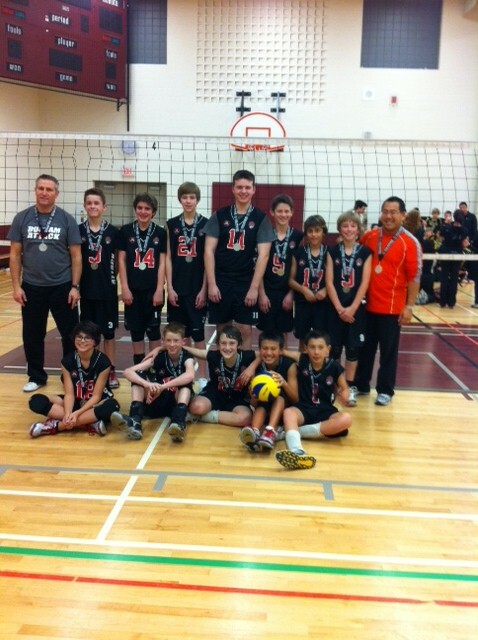 The Provincial Cup at Stouffville High School was The Black Venom’s first OVA tournament of the season. This tournament used the Triple Ball format. The first game was against the Ottawa Fusion. The first set, the boys dominated the Fusion with their strong hits and they beat the team 25-16. In the second set, the boys played hard and tough, but the boys still lost 20-25. In their third set, the boys were going back and forth with their points, but eventually Attack pulled ahead, winning 15-11. The next match was against Markham Stingers. The boys were ready to beat this team because last tournament they lost to the same team in the quarter finals. In the first set, the boys were ready to crush them, as they did, with the score turning out 25-9 and in the second set winning 25-18. After a break, the boys played the Maverick Broncos (Ottawa). The first set turned out to be a close game as the boys kept switching points. Near the end of the game, the boys pulled through and won 25-21. In the second set, the boys played much more aggressively and they won 25-18. In the semi-finals, the Attack Venom played a very strong Cobourg team. There was a little tension between one of the Attack players (formerly from the Cobourg team) and the Breakers team. In the first set, Durham Attack dominated Cobourg with the strong hits and good passing, as they won 25-8. In the second set, the boys played hard, but lost 19-25. In the last set, everyone was nervous, but Attack pulled ahead and won 15-12. In the finals, the boys lost to a tough and tall WASPS team from Markham, 25-15 and 25-16. Overall, Durham Attack placed second for the boys U14 Provincial Cup and took home silver. The whole tournament was a great learning experience and exciting and enjoyable for everybody. Good job, Attack!! Thank you to all parents and a special thank you to Mike Richardson for great coaching.